The world was changing when Justice Kin Kee Pang, Arts’70, took his final Queen’s exam in 1970. Computers were about to revolutionize industries, the war in Vietnam was dividing the world, and China was in the midst of the Cultural Revolution. The now-retired Judge of the High Court in Hong Kong credits his Queen’s education for helping him prepare for those changes and launching a long and successful legal career. 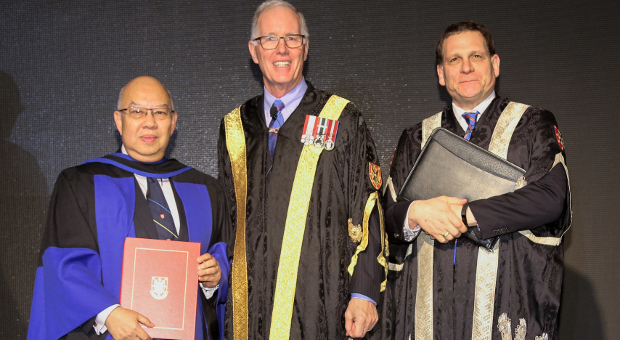 More than four decades after graduating, Justice Pang was part of a history-making day in Hong Kong on May 20 when he received the first Queen’s honorary degree conferred outside of Canada. It was a part of a special weekend of events as Queen’s continues to deepen its ties with alumni and partners in the Asia-Pacific region. The honorary degree ceremony was part of two events in Hong Kong that took place in celebration of Queen’s 175th anniversary. Many of Queen’s senior leaders – including Chancellor Jim Leech, MBA’73, Principal Daniel Woolf, Artsci’80, Rector Cam Yung, Artsci’17, Vice-Principal (Advancement) Tom Harris, Sc’75, and Provost Benoit-Antoine Bacon – crossed the globe to gather with alumni, students, and academic partners for a convocation-style event in the afternoon and a gala black-tie dinner in the evening. “We wanted a history-making event with the Queen’s community in Hong Kong, deliberately concluding our 175th-anniversary celebrations in a location outside North America,” says Principal Woolf. “Hong Kong, which became a British colony in the same year that Queen's University was established, has one of our most active international alumni branches and was the perfect location in which to signify our increasing global engagement." If Queen’s wants to continue to grow for the next 175 years, it needs to look beyond Canadian borders and build and strengthen its global ties. The Comprehensive International Plan, launched in 2015, has focused the University on a new set of priorities, expanding relationships with global research partners and attracting the best students and faculty from around the world. “Queen’s is thriving today, but we need to keep our eye on the future. And the future is global,” Provost Bacon said. Honorary degree recipient Justice Pang with volunteer members of the Hong Kong Alumni Branch. The afternoon convocation-style ceremony brought many of the Queen’s traditions to the engaged alumni. The ceremony itself took place against a photographic backdrop of Grant Hall projected on a ten-foot by 20-foot LED wall, giving alumni the feeling they were back on Queen’s campus. Along with Justice Pang’s honorary degree conferral, alumni walked across the ballroom stage to shake hands with Principal Woolf, Chancellor Leech, and Rector Yung, and reconfirm their commitment to their alma mater. The ceremony was followed by a black-tie gala dinner with a keynote address from Queen’s Professor Emeritus and Nobel Laureate Dr. Arthur B. McDonald. The positive feedback from Hong Kong alumni is a true testament that tricolour spirit lives well beyond Canada’s borders. Hong Kong Branch executive member and Chair of the Advisory Board for the event, Edmond Chan, Artsci’97, was happy so many campus leaders from Kingston travelled 12,500 kilometres to meet with local alumni and students. “The tricolour spirit is powerful and there is no known cure for it. The response from the Hong Kong alumni community was tremendous. It was an amazing day – both events were packed with people sharing their favourite Queen’s memories and reconnecting with the school. We all look forward to the next signature event in Hong Kong,” says Mr. Chan. Following events in Hong Kong, Provost Bacon and Associate Vice-Principal (International) Kathy O’Brien, travelled to Guangzhou, Shanghai, and Qingdao. They signed several Memorandums of Understanding (MOUs) with Chinese universities on issues ranging from mental health research to collaborating on a dual degree master’s program in Education. Provost Bacon and Ms. O’Brien also hosted an event for alumni, students, and university partners in Shanghai on May 24. Please visit the Queen’s Alumni Flickr album for more photos from the Hong Kong 175th events.